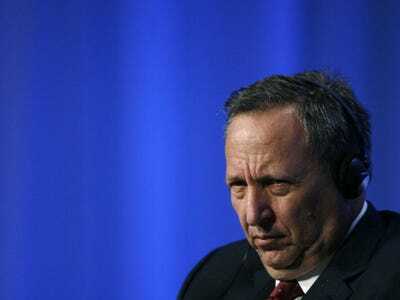 The basic idea behind secular stagnation is that the economy in its current condition is unable to create enough demand to sustain its growth trend, requiring negative interest rates for the Fed to hit its employment and inflation goals. In a note to clients over the weekend, Goldman Sachs economist Jari Stehn revisits Summers’ hypothesis, and writes that while it’s still early, there are signs pointing towards a US economy that may not, in fact, be stuck in secular stagnation. The key figure proponents of the secular stagnation hypothesis point to is the “output gap” that has shown up in the economy since about 2006. 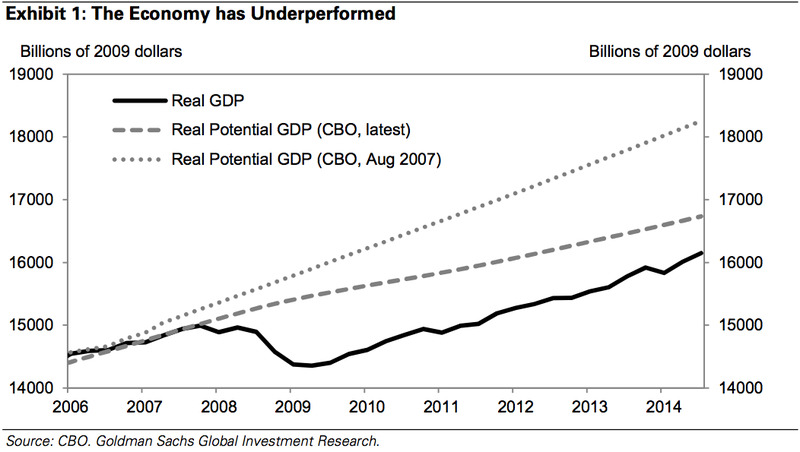 Since 2006, the US has underperformed the Congressional Budget Office’s projections for real GDP. And so while the financial crisis and resulting recession certainly put a dent in GDP, the economy still hasn’t gotten back to the growth trend it was experiencing before the crisis. The the economy has failed to close this “output gap” has been a staple of the argument that we’re stuck in secular stagnation, and that our economic problems of the last several years are secular rather than cyclical. 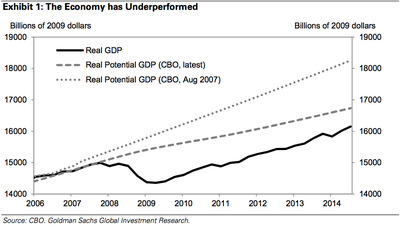 Goldman expects the US economy to experience above-trend growth through 2017. 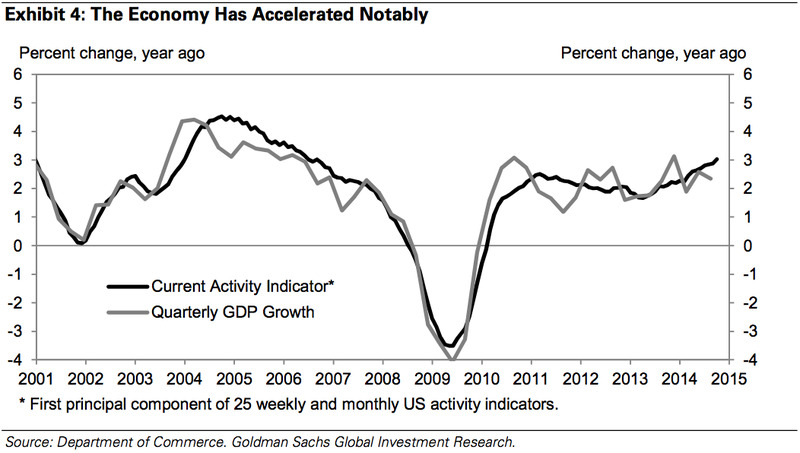 This is in contrast to an economy stuck in secular stagnation, which would not see above-trend growth over a period of several years. 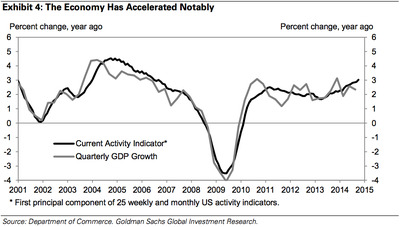 As evidence that the US economy is beginning to meaningfully take off, Stehn cites Goldman’s Current Activity Indicator (CAI), a composite figure developed by Goldman Sachs that is 25 economic indicators, including things like the jobs report, jobless claims, and manufacturing surveys. Over the past year, the CAI has increased by 3%, the fastest since the recession. And while Stehn notes that this is just a preliminary sign rejecting secular stagnation — and that these gains have been made with rates at 0% — the improvement in the CAI is a sign that the economic malaise of the last 5 or so years was cyclical rather than secular. As far as monetary policy is concerned, Stehn writes that even if the economy has been slow to recover due to cyclical rather than secular problems, it will likely still be appropriate to keep policy accommodative (i.e., keep rates “lower for longer.”). But Stehn is optimistic that the US economy, while disappointing over the last several years, is not stuck in the economic purgatory that secular stagnation implies. That fate, Stehn writes, may belong to Europe.